We are pleased to present Evolution Jumbo 12, the long awaited 12-string acoustic addition to our Evolution guitar series, recorded from a Taylor 355. This guitar sports a silky high end, yet an ample amount of body in the lows and mids--undoubtedly the result of it being a larger sized guitar. Mixed prominently, Evolution Jumbo 12 can cut through the mix with its crisp, bright tone. Played at a feathery-soft dynamic, it adds an exquisite shimmer to your arrangement. We developed the library in collaboration with Rosewood Recording Company, one of Utah's most venerable recording studios. Guy Randle, the owner and recording engineer at Rosewood Recording Company, incorporated analog audio equipment to skillfully sculpt and emphasize the rich tonal qualities of the guitar. Evolution Jumbo 12 includes both the as-recorded signal as well as an enhanced signal. Although we feel that the latter option best represents our vision for the sound of the acoustic guitar, the unprocessed signal is also at your disposal for additional flexibility. 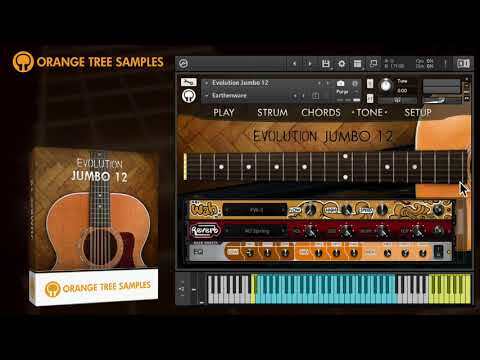 Evolution Jumbo 12 is outfitted with our Evolution guitar engine which provides you with a wealth of appointments: an innovative strumming pattern editor, automatic chord detection, and a robust effects engine. The library includes many factory presets for ready-to-use classic and modern 12-string acoustic guitar tones that fit right into the mix. - Built-in effects engine for instantly-usable 12-string acoustic guitar tones. - 11.9 GB (compressed to 4.76 GB using the lossless NCW audio format) of 24-bit samples. 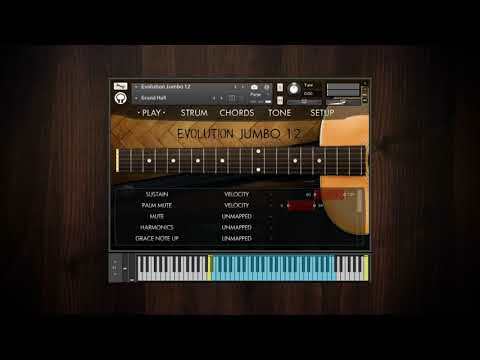 Evolution Jumbo 12 licenses Native Instruments' Kontakt Player sampler software. 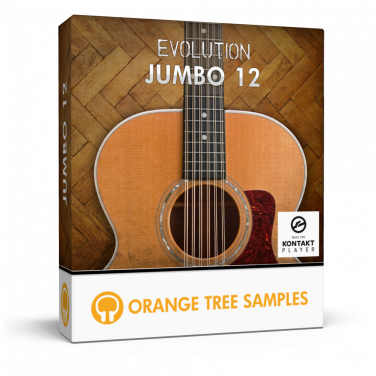 Consequently, owning the full version of Kontakt is not necessary, and Evolution Jumbo 12 operates without limitations within the free Kontakt Player application/plugin. This also allows the sample library to be listed in the libraries tab in Kontakt for convenient access. Evolution Jumbo 12 is NKS-ready. The integration with the Native Kontrol Standard presents many benefits, both when using the library in the Komplete Kontrol software as well as in conjunction with Komplete Kontrol hardware, such as the Komplete Kontrol S-Series keyboards and Maschine. 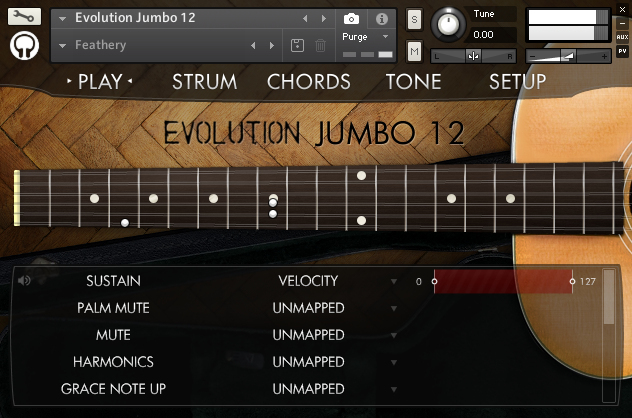 In addition to Evolution Jumbo 12 being displayed in the Native Browser among your other Komplete Kontrol instruments, there are a variety of other benefits. For example, thanks to Native Instruments’ Native Map® technology, you can control the library’s various parameters directly through connected hardware right out of the box. Furthermore, the keyswitches and key ranges are shown using Light Guide, an innovative technology that displays the key colors directly on your Komplete Kontrol S-Series keyboard. We recommend using Evolution Jumbo 12 with a Komplete Kontrol S-Series keyboard for the full experience. While not a requirement, you will be able to take advantage of the Native Kontrol Standard for an intuitive connection between software instruments and hardware. This product requires a total of 10.2 GB of free disk space in order to download and install the sample library. The total size of the download is 5.15 GB, and after installed the library occupies 5.05 GB.